Enjoy the delicious sweet flavor of this exotic root vegetable in our sweet potato soup. Sweet potatoes make excellent soups with their sweet, slightly spicy taste. We’ve added cumin for extra spice and some apple for tartness. The result is a wonderful, heart warming soup. First you need to prepare your vegetables. Peel and chop the sweet potato into chunks. Everything is going to be pureed later, so you don’t have to be particularly dainty. 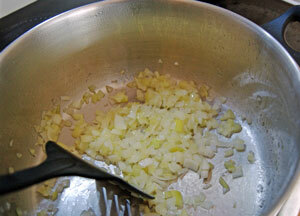 Then chop the onions, crush the garlic cloves and slice the celery. The apple needs to be peeled, cored and chopped. But to prevent it going brown and unsightly, leave preparing the apple until just ready to go into the pot. Heat the oil in a large saucepan. Add the onion and cook, stirring occasionally, for 10 minutes, or until it becomes soft and transparent. 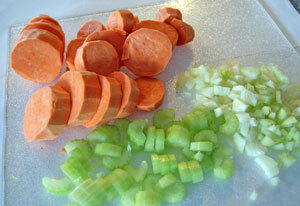 Add the garlic, sweet potato, celery, apple and 1 teaspoon of the cumin. Continue to cook for 5 – 7 minutes. This will release the flavors of the cumin and coat the vegetables. Add the chicken stock and the remaining cumin and bring to the boil over a high heat. 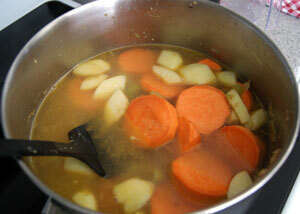 Reduce the heat, cover and simmer for 25 – 30 minutes, or until the sweet potato is very soft. Remove the soup from the heat and leave to cool slightly. 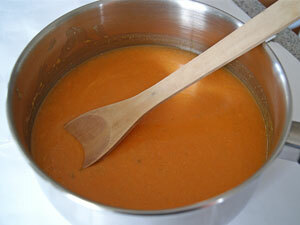 When the soup has cooled sufficiently, spoon into the bowl of a food processor and process until smooth. Do this in batches. Don’t use all of the stock to begin with, particularly if you prefer a thick, rich soup. Keep adding more stock until you reach the desired consistency. Return the stock to the saucepan to reheat. I prefer to use a clean pan for this. Keep stirring over a medium heat until warmed through, making sure it doesn’t come to the boil. Season with salt and freshly ground black pepper. 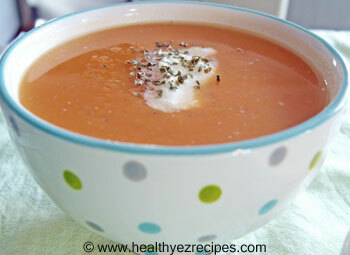 Ladle the soup into soup bowls and top each serve with a dollop of yogurt. Sprinkle over chopped chives. Use orange sweet potatoes for this recipe. They are sweeter than other varieties.